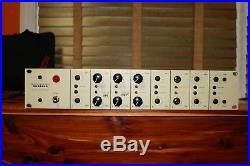 For sale is a Seventh Circle Audio chassis loaded with three microphone preamps and two channels of DI. The first preamp is SCA's A12, which is a clone of API's 312. The second preamp is the N72, which is a clone of the Neve 1272. The last channel is the J99, which is a clone of the Jensen/John Hardy Twin Servo 990. I added a switch on the back to select output impedance. 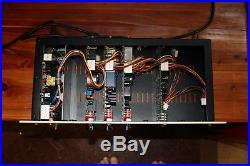 All preamps are discrete, with transformer input and output. The D11 module is a 2 channel solid state DI with switchable input impedance. The item "Seventh Circle Audio 3 Preamps+2 DI's, N72 Neve, A12 API, J99 John Hardy, D11" is in sale since Wednesday, July 25, 2018. This item is in the category "Musical Instruments & Gear\Pro Audio Equipment\Preamps & Channel Strips". The seller is "telecasterdc" and is located in Gilbertsville, Kentucky. This item can be shipped to United States.